A Soyuz rocket launched an American astronaut, two Russian cosmonauts and 32 small fish into orbit Tuesday (Oct. 23), kicking off a five-month mission to the International Space Station for the human and aquatic explorers. 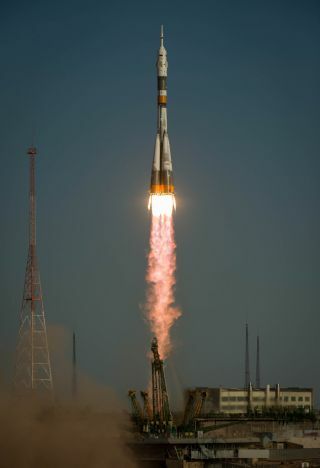 Riding aboard the rocket's Soyuz TMA-06M space capsule are NASA astronaut Kevin Ford and Russian cosmonaut s Oleg Novitskiy and Evgeny Tarelkin. The three men are due to dock at the station on Thursday (Oct. 25) at 8:35 a.m. EDT (1235 GMT), and join three other crewmates already aboard the orbiting lab. Novitskiy is commanding the Soyuz flight. On Sunday (Oct. 28), a robotic Dragon space capsule built by the private spaceflight company SpaceX will depart the space station to wrap up the debut cargo delivery flight for NASA under a $1.6 billion commercial resupply contract. Days later, on Wednesday (Oct. 31), an unmanned Russian Progress spacecraft will launch and dock at the space station within six hours to deliver tons of more cargo. Then on Thursday (Nov. 1), Williams and Hoshide will venture outside the space station in a spacewalk to fix an ammonia leak in the orbiting laboratory's cooling system.